INVESTORS WERE skittish as 2018 drew to a close, fretting about global economic prospects. Fears about a slowdown in China have swirled in recent weeks: the pace of GDP growth fell over the course of 2018, as did retail and vehicle sales. The purchasing managers’ index survey, released on January 2nd, suggested that manufacturing activity in China had contracted in December. Later that day Apple said it was revising down its earnings expectations in the fourth quarter of 2018, largely because of lower sales and signs of economic weakness in China. The news rapidly infected financial markets. Apple’s share price fell by around 7% in after-hours trading and the decline was extended to more than 10% when the market opened. The dollar fell by 3.7% against the yen in a matter of minutes after the announcement, before rapidly recovering some ground. Asian stockmarkets closed down on January 3rd and European ones opened lower. Yields on government bonds fell as investors fled to the traditional haven in a market storm. In a letter to investors Tim Cook, the company’s chief executive, said he expected revenues in the fourth quarter of 2018 to be $84bn—around 10% lower than the company had pencilled in two months ago. Mr Cook pointed the finger at escalating trade tensions between America and China, which he said had hit retail footfall. Sales in China account for around a fifth of the company’s total revenue. President Donald Trump’s trade war may be inflicting damage on companies at home. Kevin Hassett, his economic adviser, warned that “a heck of a lot of companies” may join Apple in announcing lower-than-expected profits because of the trade dispute. A sharp decline in America’s purchasing managers’ index added to investors’ worries and exacerbated market falls in early Wall Street trading. Slowing consumer demand may also be accelerating trends in the smartphone industry. Shipments have declined over the past year as the market has matured, and Apple is particularly dependent on its iPhone business. More than half of its revenues come directly from iPhone sales; another chunk comes from services sold to iPhone owners. 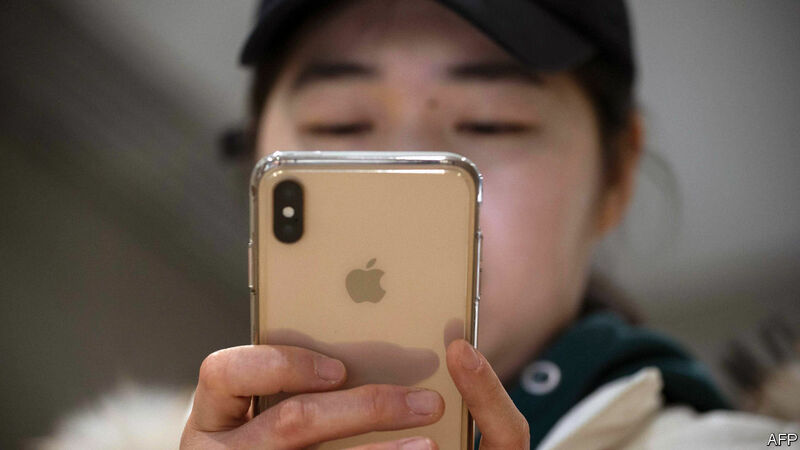 Apple’s troubles in China may also be a sign that the company is losing out to home-grown competitors, which have seen rising sales volumes. Apple lost market share steadily in 2018. Some analysts parsed this as a possible sign that Apple’s price hikes, an attempt to shore up revenue in the face of falling smartphone volumes, are no longer paying off. If they are right, that would be bad news for Apple’s investors. But if they are not, what the company’s announcement says about the global economy should worry all investors. Previous PostPrevious What are hypersonic weapons?